MOSCOW --- Russian Helicopters (part of Rostec State Corporation) successfully completed preliminary flight tests of the Mi-26T2V helicopter. The machine is being prepared for a handover to the Russian Ministry of Defense to do joint official tests. The new helicopter differs from the basic Mi-26 model due to a modern integrated NPK90-2V avionics suite, which significantly simplifies piloting of the helicopter. The latest avionics system allows following the route in automatic mode, coming to a preset point, performing approach and final approach maneuvers, and returning to the main or alternate aerodrome. The helicopter is also equipped with a digital flight center, and the crew cockpit has multi-function color LCD indicators that significantly reduce the workload of the flight crew. 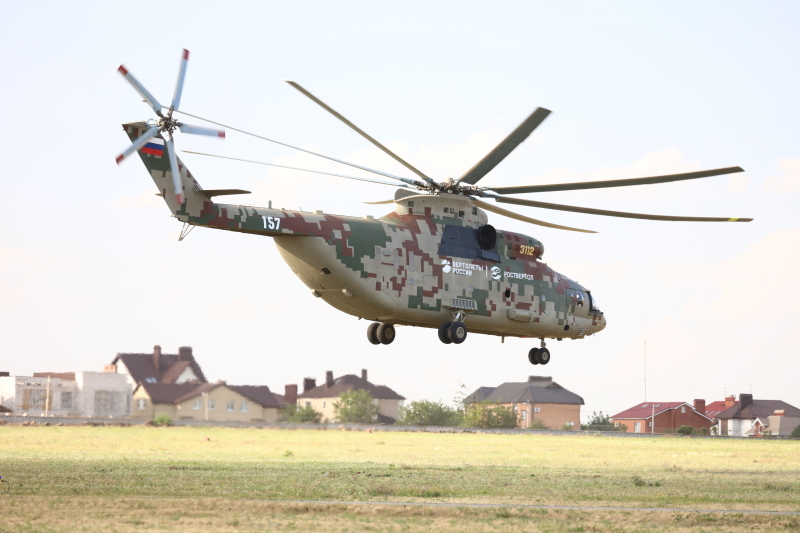 Moreover, Mi-26T2V got a new airborne defense complex Vitebsk that not only detects a threat to the helicopter, but also repels attacks. JSC "Russian Helicopters", a part of Rostec State Corporation, is a leading player in the global helicopter industry, the sole Russian designer and manufacturer of helicopters. The Holding Company was established in 2007 and is headquartered in Moscow. We operate five helicopter assembly plants, two design bureaus, component production and maintenance enterprises, aircraft repair plants and one helicopter service company providing after-sales support in Russia and abroad. -- April 03, 2019 @ 17:00 CET: added photograph.